Genna and Rakhat prepare to release doves as part of the Kyrgyz wedding festivities. During the spring semester of 2008, I decided to study abroad in the rustically beautiful country of Kyrgyzstan. Many would be surprised at my exotic choice of destination (which is actually increasingly popular among SRAS students). However, what really set my study abroad experience apart from the ordinary was me. For I was not only traveling to Kyrgyzstan to study its language, meet its people, and witness its culture, I was also going to Kyrgyzstan to get married. I had met my then-fiancé, Rakhat, in Minnesota, where we had both taught at a summer Russian language camp, Lesnoe Ozero. Rakhat is a native of Kyrgyzstan, and like most Kyrgyz, speaks both Russian and Kyrgyz fluently. Over the course of the summer, we fell in love and spent our free time together. When the camp ended, Rakhat stayed at my family’s home for a month. Though my family was initially surprised that I was interested in a Muslim man from Kyrgyzstan, they soon began to appreciate his infectious love of life and kind spirit. As his visa expired and he returned to Kyrgyzstan, we said a tearful farewell, but decided to keep in touch through frequents calls and emails. Our relationship only grew as we were apart. Missing him and wanting to learn more about his culture, I looked into study abroad programs in Kyrgyzstan. Researching online, I decided to study there through SRAS. SRAS helped me arrange academic courses and travel logistics, but also allowed me the independence and freedom to take advantage of my own resources in that country. As the time grew near for me to fly to Kyrgyzstan, Rakhat called me. I could hear the nervousness and anticipation in his voice, as he asked me if I was ready for him to ask me a big question. When I said yes, he asked me to marry him. It was the happiest moment of my life, because I knew that he was the perfect man for me. A month later, on December 31, I arrived in Kyrgyzstan – in the middle of the coldest winter there in years. Snow swirled in the sky and sub-zero degree air rushed toward my face as I stepped off the plane. But I was too excited to be deterred by the shock of the cold. As quickly as I could, I passed through customs. Rakhat was waiting in the reception area with his parents, who warmly embraced and kissed me. I had arrived purposely well before the beginning of spring semester, so that I could spend time with Rakhat and getting to know his family better. I spent a week at his parents’ home in a village in the sparsely populated Kyrgyz countryside. Genna and Rakhat take a ride on a Kyrgyz donkey cart. It took more than hour to travel there. As we excitedly drove along the country roads, we passed snow capped mountains, towering over expanses of barren winter land. There were Kyrgyz horsemen guiding sheep to mountain pastures and old men ridding in donkey carts to the weekly Sunday bazaar. The village we arrived at consisted of small homes occupying less than an acre of land apiece. The Kyrgyz use the land surrounding their home to raise their food. Every home has a corral in back with sheep, cattle, and sometimes horses. Horses for the Kyrgyz are not only a source of transportation, but also a source of meat and milk. The gardens, which were then covered with snow, would be overflowing with vegetables and fruit come spring. Rakhat’s home had electricity and a color TV, but no running water. They would drive the family car, in the dead of winter, to the village well once a day. Rakhat told me that the problem is not that his parents cannot afford running water, but that the infrastructure in his village is poor and the pipelines freeze in winter. During my first night in Kyrgyzstan, I had the privilege of experiencing a Kyrgyz New Year. Rakhat’s parents prepared an enormous feast of boiled mutton, noodles, fried bread, salads, dried fruit, and delicious homemade jams. Rakhat’s family gathered at his parents’ home to give everyone good wishes for the coming year. They wished me a wonderful stay in Kyrgyzstan, health, happiness, and many children. After all the well-wishes were said, we headed outside to light fireworks. The cold weather, however, prevented us from staying outside long. I learned during my first night that the Kyrgyz are adept at conserving heat in their cold winters. As wedding presents, all women receive many intricate, handmade blankets stuffed tightly with wool. The wall in the guest room was stacked high with three piles of blankets, over thirty in the guest room alone and there were many more elsewhere in the house. Even when the heat failed and it was -4 °F outside, I slept soundly under my pile of blankets. The next day, Rakhat’s family decided that we should make our engagement formal according to Kyrgyz tradition. All of Rakhat’s immediate relatives gathered at his home. To solidify the bond, Rakhat gave me a gold ring, and a cup of water was passed around from which everyone drank. According to Kyrgyz tradition, we were a couple then, and could live together, even though we were not yet legally married. The Kyrgyz often have these informal unions before the formal wedding. Genna with a plate of Bishbarmak, a Kyrgyz noodle dish whose name means “Five Fingers.” It is traditionally eaten without utensils. As I spent more time with Rakhat’s family, I learned that Kyrgyz culture is interwoven with numerous customs, all of which must be followed carefully to avoid causing offense. For instance, the Kyrgyz highly value the elderly and always organize seating arrangements according to age. If there are no guests, the oldest has the privilege of sitting farthest from the door, the second oldest second farthest from the door, and so on. If there are guests, the guests will be seated farthest from the door, and also arranged according to their ages. When a new person arrives, it is like musical chairs as everyone rearranges themselves to sit according to their status. Similarly, all food must be served according to age, with the elderly being served first. Meat especially carries great significance. Children are often given boiled ears, which symbolize that they must learn to listen to their elders. New brides are often given thighs, which show appreciation for their hard work. In many areas of Kyrgyzstan, the eldest is given the animal’s head, symbolizing their wisdom. In Kyrgyz culture, one’s status in a gathering is always quickly apparent. As Rakhat’s fiancée, I was able to see more of Kyrgyz culture than a typical American. The Kyrgyz never allow their guests to do any work around the house, but I was not exactly a guest – I was a family member. In Kyrgyz culture, women join their husband’s family, and the bride’s mother-in-law teaches her the skills that she will need in her marriage. This is most important for the woman who marries the youngest son, since the young couple will have the responsibility of living with his parents their entire lives. Luckily, Rakhat is a middle child, so we have the freedom of living wherever we wished and we would choose to live in America. Working with Rakhat’s mother, I learned to wash dishes using as little water as possible (as the water needs to be carried into the house, it’s best to conserve it). Over the course of my visits to their home, I learned to cook traditional Kyrgyz meals. I had extra practice as well because many western staples are still unavailable in Kyrgyzstan, so cooking local dishes is much easier. I found I was making them for myself when I moved into an apartment in Bishkek to start my classes at the American University – Central Asia. 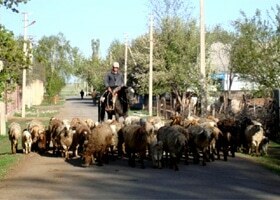 A Kyrgyz man herds sheep through his village. Kyrgyzstan’s majestic mountains enchanted me, but I found the people even more remarkable. Only one hundred years ago, most Kyrgyz were nomadic, living in felt yurts and herding sheep from atop horses. Though few Kyrgyz are still nomadic today, most of the country is still rural. The description given of Rakhat’s village still describes the experience of most Kyrgyz. The animals and gardens supply most of their food year round. The Kyrgyz also will consume every edible portion of a slaughtered animal and even find uses for the bones. Sheep’s wool is used to hand-craft their intricate rugs, called shyrdaks, and comfortable felt slippers. Though the world has changed much in the past hundred years, the Kyrgyz way of life in the villages has changed little. As spring came and the snow melted, everyone enjoyed being outside. I especially enjoyed watching the culture of the children. Young boys cavorted about with handmade bows and arrows, climbed trees, and dug giant holes in the ground with their hands (the purpose of which I never understood). One game that I found particularly interesting involved tossing sheep vertebrae. The boys would toss the bones and see which side turned up to decide who would keep the bones. Though they had far fewer toys than most American children, the Kyrgyz children always seemed to be making up new games and enjoying life. 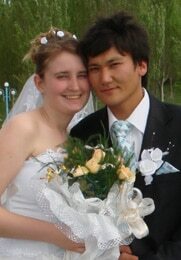 In April, Rakhat and I celebrated our wedding in Kyrgyzstan. On the day of the wedding, we woke up early and drove to his family’s home. There, we gathered for tea and toasts before beginning the big day. In Kyrgyz culture, the wedding party visits notable landmarks before the marriage ceremony. This seems to be a tradition borrowed from the Russians, but which the Kyrgyz have adopted eagerly. We visited the village’s lake, Bishkek’s World War II memorials, and a display of traditional Kyrgyz yurts. At one of the memorials, we released doves into the air, a traditional wedding practice. Felt purses, slippers, hats, coasters, and stuffed animals made by Rakhat’s mother. On the bottom, you can see a rug she also made. After touring the area for several hours, we arrived at the wedding ceremony. We entered the reception to sounds of cheers, and were led to a head table adorned with balloon pillars and flowers. Waitresses brought dishes of boiled fish, noodles, fried bread, dried fruits, candies, boiled meat, and a vast array of salads to each table. In Kyrgyz culture, the food is one of the most important parts of the wedding. According to tradition, all the guests should leave the wedding completely stuffed. Vodka, however, is even more important, and everyone was soon in merry spirits as they made numerous toasts followed by vodka shots. One of Rakhat’s uncles, known for his lighthearted spirit and playful nature, was in charge of making sure the guests were having a good time. He made frequent jokes, and at times began different activities, such as having people complete Kyrgyz sayings or sing traditional songs. He gave the winners small prizes, such as tea cups. In groups, Rakhat’s uncle led the guests to the front to congratulate us. Each of them gave us a warm welcome, and delivered a rather lengthy speech about the meaning of marriage and wishing Rakhat and I well in our future married life. After finishing the speeches, Rakhat’s relatives welcomed me into their family in the traditional Kyrgyz manner, placing beautiful headscarves on me as they kissed my cheek and wished us happiness. 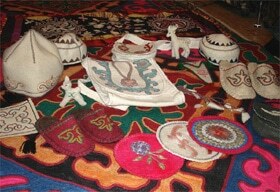 The headscarves in Kyrgyz culture symbolize that a woman is married. In more traditional households, women always wear a headscarf when visiting their in-laws. New brides are proud of their scarves and will hang them on display for at least a few weeks after the wedding. Those who receive more scarves generally have more friends and the community as a whole thinks highly of them. Rakhat and I returned to Bishkek with a large pile of scarves. In May, classes ended and Rakhat and I spent the last few weeks with his parents before leaving for America. It was much more pleasant to be in the village during the spring time. In early May, the weather was a balmy 75 °F, and the outdoor markets were stocked high with cherries, strawberries, potatoes, carrots, and many other fruits and vegetables. Genna and Rakhat in downtown Bishkek on their wedding day. We made one big trip before leaving Kyrgyzstan to visit Kyrgyzstan’s largest lake, Issik Kol. It was one of the most gorgeous places I have ever been. Giant mountains towered above the clear blue lake. Young people on horseback raced along the beach. I saw men gallop full speed, swing themselves upside down, grab a flower from the ground, and toss themselves right side up again. The Kyrgyz are famous for their equestrian skills, and it was a pleasant surprise to be able to watch them. It soon became time for us to leave. Rakhat’s mother made beautiful handmade rugs and seat cushions for us to bring with us to America. Our suitcases became stuffed with Kyrgyz handmade slippers, cognac, and candies because all of Rakhat’s relatives gave us gifts to bring to my family. When it came time for us to leave, it was difficult, especially for Rakhat, because we did not know when we would be able to see his family again. We are living happily in Michigan now. Rakhat is awaiting his green card – a rather lengthy process – before he will be allowed to legally work. When he receives his green card, he would like to find a job with an international relations institute, and eventually work for the United Nations. Meanwhile, I have graduated from the University of Michigan with a degree in Russian and Eastern European Studies. I hope to apply my Russian area knowledge to a career in international business or foreign policy. It will likely be several years before Rakhat and I can return to Kyrgyzstan, but I am very grateful for my time there. Studying abroad in Kyrgyzstan was a fascinating opportunity to learn about a culture so different from my own, but which will now be a part of me forever. The author of this story, Genevieve Gunow, spent the spring semester of 2008 at the American University – Central Asia in SRAS’s Russian as a Second Language program, studying Kyrgyz as well. She has recently graduated from the University of Michigan-Ann Arbor with a degree in Russian and Eastern European Studies and is now applying for employment in the fields of international business and foreign policy.